Depression is a common condition that affects as many as one in ten American adults every year and can have a serious impact on everyday life. There are many factors that can lead to clinical depression, and one common belief is that diet and depression are linked, but is this really true? 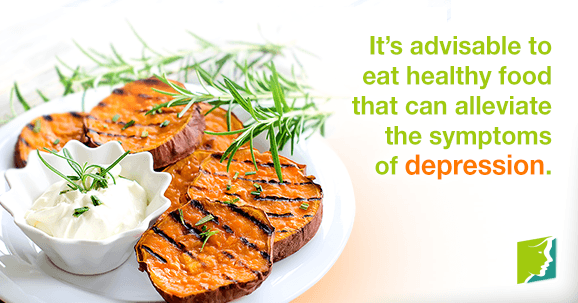 Read on to find out more about whether or not a poor diet and depression are connected. Depression is a mental condition that means the sufferer feels a chronic state of sadness that does not go away on its own. It can sometimes be triggered by an event, but can also have no apparent cause. It is different from sadness in that sadness is a natural human emotion in response to a tragic situation, and people are generally able to get on with everyday life, at least after a time. In people with depression, their reactions can often seem out of proportion to the event, and they find it impossible to see the positive aspects of a situation. There is plenty of evidence that seems to point to the fact that a poor diet can increase risk of depression. One example is a study in Britain that monitored over 3,000 participants and found that those who had a diet high in processed meat, chocolate, fried food, refined cereals, and high-fat dairy products were far more likely to experience symptoms of depression. On the other side of the coin, a healthy diet actually seems to reduce the risk of depression. Other research findings are that people who eat a diet that includes lots of fruits, vegetables, and fish in particular are at a lower risk of being depressed. In short, the advice seems to be cut back on junk food and eat more healthy foods, but some people are unsure what exactly constitutes "junk food." The following list gives you advice on a few things to avoid. Unfortunately, this is ubiquitous in modern society, and it's almost impossible to avoid completely. However, by cutting down on your intake of chocolate, chips, and sweets, you can keep the refined sugar to a minimum. The occasional treat will not do any harm, but eating them regularly will mean the blood sugar is constantly rising and plummeting, and this can have a disastrous effect on mood. Some people who are trying to improve their diet by avoiding refined sugar will often opt for the "sugar-free" options. However, this can also cause dips in mood, so in essence, the devil is being traded for the deep blue sea. Most fizzy drinks or foods that claim to contain no sugar use aspartame to make it taste just as sweet. Unfortunately, this can block the production of the natural mood elevator, serotonin, and can contribute to depression. Processed food essentially means food that has been changed from its original whole form, and can encompass a whole range of modern foods. However, the ones that are generally going to be harmful are foods that have been changed out of all recognition or that rely on additives for their taste. It is always best to buy raw ingredients to make meals and snacks rather than relying on pre-packaged foods. Often, the initial insulin boost can suddenly drop, and this can lead to fatigue, irritation, and depression. While not the whole answer, improving diet could help alleviate symptoms of depression. This is usually done in conjunction with therapy or medication.